(Nanowerk Spotlight) In January 2007, China successfully tested an Anti-satellite (ASAT) missile system by destroying their own defunct LEO satellite, which generated huge amounts of space debris. This ASAT test raised worldwide concerns about the vulnerability of satellites and other space assets and possibility of triggering an arms race in space. In order to meet emerging challenges posed by such ASAT missile systems, military strategists and researchers are developing novel technologies to protect their space assets. In view of the above, Raytheon Company has developed a counter measure system using quantum dots to protect space assets such as satellites from missile attacks. They have developed a decoy consisting of quantum dots of different sizes and shapes that are engineered to emit radiation having a radiation profile similar to that of the asset. This decoy is found to be more accurate in mimicking the radiation profile of the asset, thereby diverting the anti-satellite weapons from the target more efficiently than the existing conventional counter measure systems which use pyrolytic materials like Magnesium-Viton-Teflon (MVT) flares to generate intense radiation by means of an exothermic reaction. Such conventional counter measure systems are usually limited by the availability of oxygen in the space environment (for exothermic reactions) and they are inadequate in many aspects as new devices like Long Wavelength Infrared sensors (LWIR) are now able to easily differentiate between the decoy and the target spacecraft. Protection systems for the growing number of satellites and other space assets against hostile threats and collisions should have the ability to precisely replicate the spectral signature of the target to act as an effective decoy. Quantum dots are well known for their size-dependent electro-optical properties, and by controlling the geometrical size, shape and the strength of the confinement potential, they can be easily tuned to emit radiation at desired wavelengths. These quantum dots can be engineered to produce any kind of spectral signature by mixing different kinds (InSb, PbTe, HgTe, HgSe, CdTe, CdSe and CdS) and sizes in the required ratio so as to mimic the exact spectral signature of the target (Fig. 1). Fig 1: Emission range of various quantum dot materials: Left end of each bar represents the resonant emission peak corresponding to a quantum dot of 3 nm size and the right end corresponds to the same material in bulk. The researchers propose that such a mixture of quantum dots, when dispersed like a cloud in space, may act as an efficient decoy, making even the advanced sensor devices unable to differentiate between the target and the decoy. The cloud of quantum dots can be created either by exploding a small pack of quantum dots suspended in an inert gas (Argon/Helium) or by just spraying them from a storage tank. Fig. 2 is a schematic of a counter measure system employing quantum dots to divert the missile attack from a spacecraft or a satellite. 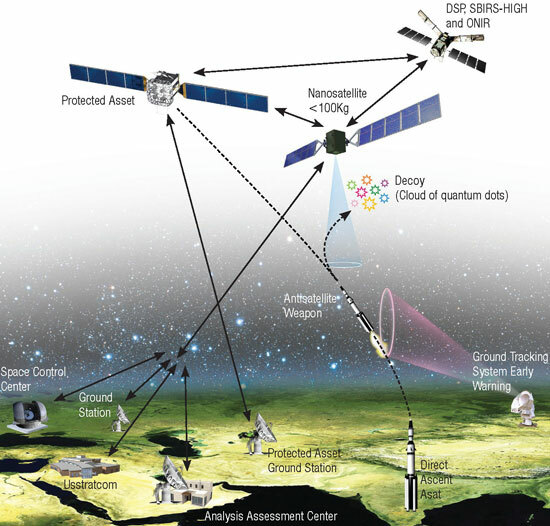 As can be seen, the space asset that is to be protected is monitored for threats by a ground tracking system which sends early warnings about a detected missile to the space control centers which in turn can activate the guardian satellite (a nanosatellite of less than 100 kg) orbiting in the co-orbit of the space asset. Upon activation the guardian satellite releases the cloud of quantum dots so as to trick the missile into seeking the decoy instead of the protected asset. Fig 2: Schematic of a countermeasure system: Anti-satellite weapon seeks the decoy cloud of quantum dots instead of the target satellite. Besides the above said set-up, this counter measure system employing quantum dots can also be implemented in any communication set-up that uses different sensors and warning systems.